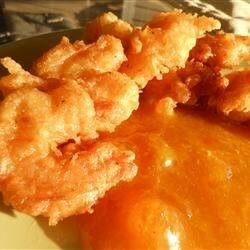 "Deliciously breaded shrimp accompanied by a spicy sweet sauce. Not your typical fried shrimp basket. Best served immediately, doesn't keep! Perfect for fondue." Mix the peach preserves, horseradish, and mustard together in a small bowl until well blended; set aside. Whisk together the flour, baking powder, salt, garlic powder, paprika, cayenne pepper, black pepper, basil, eggs, and beer in a large bowl until smooth. Add the shrimp in batches to the batter, turning to coat. Remove with a slotted spoon, shaking off excess batter. Fry the shrimp in the preheated oil until golden, about 2 minutes. Transfer the fried shrimp to a paper towel-lined plate to drain. Serve with the peach sauce. This was delicious. The only change I made to the recipe - I didn't have peach jam, so I used frozen peach and blended. Deep fried the shrimp about 3 minutes at 375. Peach sauce was really nice and I'm going to save the batter recipe for other goodies. Yup this was quite good and I will make this again.